We love this time of year as it gives us the opportunity to sit in front of our roaring log fire with a mug of hot chocolate and slice of cake. 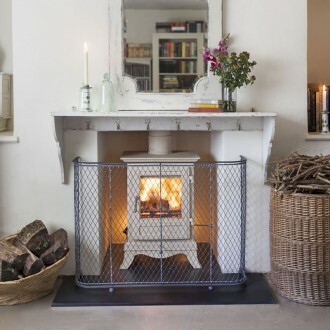 If you have an open fire or stove, one of our four sizes of fireguards would be an elegant as well as practical addition to the fireplace. Each handmade fireguard can be made to measure and if you need to stop sparks from an open fire, an optional spark liner is available. For added security, we have optional side fixings to stop little fingers pulling the guard away.